The basket bag was arguably SS17’s most coveted accessory trend, paying homage to the chic sensibility of Jane Birkin and capturing the ease of 1970s off-duty style in the most wearable manner. But now, as temperatures drop, days get shorter and trips to European coastal towns seem like a distant memory, we’re in favour of letting this humble piece remain at the forefront of our accessory arsenal. Here, we take a look at how to make your basket bag work in the city, winter coat and all. 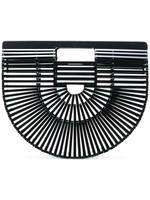 Like many modern day fashion trends, the basket bag has Instagram to thank for its rise into the style spotlight. Easy to wear and even easier to photograph, it carries an effortlessness usually reserved for the unassuming white T-shirt. Perhaps all it took was for the Fashion Week style set to approve the look before it went viral? Whoever it was, its popularity soared, seemingly overnight. All at once, the market was awash, not just with established brands offering their riffs but new and perfectly timed label / product launches which set the tone for what was to become the most accessible trend of the season. Enter Cult Gaia and its Ark bag, the graphic and (not so surprisingly) ark-shaped design that just about every editor and fashion blogger took on their trip to the Amalfi coast this summer. Initially launched in natural bamboo and now spanning a spectrum of colours as well as glossy acetate, this recognisable piece is perhaps just as at home in the city as it is poised atop a stone-brick wall overlooking Positano. For something far-removed from the norm, take your cue from journalist and fashion consultant, Celine Aagaard who grounded her vivid fuchsia Sportmax look with the black acetate variation as she hit the streets of Copenhagen Fashion Week. French label, Muuñ, took a somewhat more traditional approach to the look, crafting simple rectangular silhouettes in a range of sizes and adding removable fabric interiors for a feminine touch that added just the right amount of Riviera chic. Perfect for walks along the beach, this one’s a little trickier to adapt for winter, but if you’ve chosen a mini-sized bag (another bag trend that shows no sign of waning) or one with a dark interior then you’re absolutely in luck. Femininity stays in favour as we move into autumn so carry this all-weather design with an oversized white shirt or a knit and kick-flare jeans to really celebrate its versatility. In many instances, basket bags and pretty pompoms go hand in hand and no one does it better than Marcia Kemp’s label, Nannacay, whose light-hearted approach to design is guaranteed to put a smile on your face. When it comes to cool-weather styling, take your cue from accessory experts Anna Vitiello and Florrie Thomas at And Finally, who wear it to offset not just daytime attire but also prove that a pop of colour fares just as well with wide-leg trousers for evening. The simple answer to wearing it for now: style it by night. Blooming Dreamer’s structured style was on the scene way before spring itself with the likes of fashion blogger, Lucy Williams and Ann-Laure Mais establishing its relevance as early as January, sporting the sac du jour with oversized shearling and leather ankle boots. Staying as true to the style’s roots as is possible (it’s even called the Birkin), this iteration is the ultimate authentic basket bag. So is there any further proof needed that the basket bag works in cooler climes? Experiment with styling for autumn and wear it with the season’s most coveted hues – pillarbox red, camel and mustard are the key shades to bookmark – adding a point-toe sock boot à la Balenciaga to elevate the look. 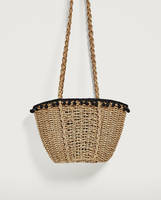 It’s fair to say that the nature of the basket bag’s materials and aesthetic lends itself well to the ever-prominent notion of ethical sourcing, and if you’re in favour of this approach, then Wai Wai Rio might just tickle your fancy, as its collections are handmade in Rio. Like other brands, this label’s style is classically circular. How to make it work in the city? Style it cross body atop a longline double-breasted blazer, wide-leg trousers and a pair of towering open-toe sandals for a contemporary take on power dressing. Why not look to our round-up of AW17 favourites, from high street to high end labels, to secure your investment in what’s proven to be a year-round essential? Discover more London fashion content here.